Hamiltonian is pleased to be the programming partner for the upcoming 5×5 Project presented by the DC Commission on the Arts and Humanities. We’ve teamed up with curator Justine Topfer fromOut of the Box Projects to create additional programming around the artists she selected for her curatorial project (home)land. The 5×5 Project is the DC Commission on the Arts and Humanities’ new temporary public art biennial. DCCAH selected five contemporary art curators to select and work with five artists to develop and present exciting, temporary art works in public spaces in the Fall of 2014. The resulting twenty-five projects served to activate and enliven publicly accessible spaces and add an ephemeral layer of creativity and artistic expression to neighborhoods across the District of Columbia. Join us for a special happy hour and late night viewing of ‘Vantage Points’ at Hamiltonian Gallery. We will be Celebrating the Hamiltonian Fellowship’s 5th year anniversary, ‘Vantage Points’ was curated by Hamiltonian alumnus Ian MacLean Davis and features new work by artists from the fellowship’s first three years. Please join us for a special collectors’ night and benefit on Thursday, October 18th. Your ticket to the Call Collect benefit guarantees you an exclusive preview of the exhibit and the opportunity to choose one work of art in the show for your private collection! Your turn to select a work of art is determined by the order in which you purchase your ticket online. For a suggested $10 donation, you will also have the opportunity to participate in special sweepstakes for an original work by DC artist Linn Meyers. Tickets are $125 per person and there will be an additional sweepstakes for an original work of art by DC artist Linn Meyers and 2012 Sondheim Prize winner, Renee Stout . Be the first to buy your ticket and choose one of the 100 works of art in the exhibit for your private collection! Featuring original works of art by 100 emerging and established artists from the greater Washington, DC metro area, Call Collect will be on view at Hamiltonian Gallery from October 20th – November 9th, 2012. As an exhibition, it highlights the extraordinary talent and diversity of our region’s contemporary art community. As a benefit in support of the Hamiltonian Fellowship program, it seeks to spark new and unexpected connections between local artists and collectors.All proceeds from Call Collect will directly support the Hamiltonian Fellowship Program, which is dedicated to advancing the professional development of emerging visual artists. On the evening of November 9th, Hamiltonian will host a special closing reception during which all collectors and artists can meet and mingle, the sweepstakes winner will be announced and collectors may pick up their artwork. Don’t miss this special event! Thank you for supporting the next generation of contemporary artists in Washington, DC. We look forward to seeing you on October 18th! We visited Hamiltonian Gallery for DC Commission on the Artsand Humanities’ Art Salon: Gratitude, where its 2010 grantees were announced. DCCAH will distribute $7.25 million in 515 grants to DC artists and organizations. 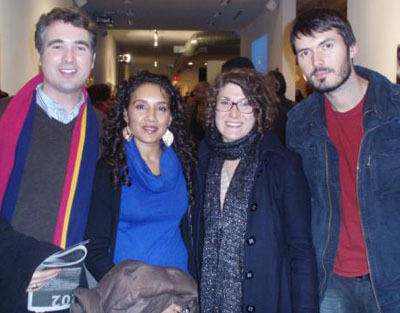 Soccer player Grady Renfrow, SRA’sKheira Benkreira, SAIS’ Dina Nawas, and Aburdene Design Group’sSarah Aburdene. Art Salon is modeled after the salons of the late 19th century to inspire the creative community. Child Ballads’ Lex Paulson, Tranquil Space’s Niyati Shah, Banished? Productions’ Melissa Krodman, and local musician Aaron Thompson. Each month, DCCAH gathers at a different location to bring together local artists. Dancing Queen, Hudson Relations & Resources’ Eric LaPrince, Michael Leonard, and Rashon Blair came to support Grammy-nominated DCCAH Young Artist grantee Christylez Bacon. >> Honfleur Gallery has a fortuitously timed exhibit for those of you feeling the charitable need to do more for those less fortunate. Their new exhibit, Stories, features three photographers who've traveled to various African countries to document issues like child soldiers and refugees from nations in conflict. The photographs provide a narrative context to raise awareness of the problems; proceeds from the exhibit go to the International Lifeline Fund. The Gallery at Vivid Solutions, around the corner from Honfleur, will hold an extension of the exhibit. Both open Friday, 7 p.m.
>> Hemphill shows off some of its best regulars in their new exhibit opening Saturday. See vintage Kodak Brownie images by William Christenberry, installation and collage pieces by Robin Rose, and prints by Donald Baechler in his Flower Studies. 6:30 to 8:30 p.m.
>> The Hemphill-run Carroll Square Gallery will also have an opening featuring 3D: Contemporary Sculpture by Kyan Bishop, Leah Frankel and Elizabeth Kendall. Friday, 6 to 8 p.m.
>> Hamiltonian Gallery opens Call and Response, an exhibit that paired 16 writers and 16 visual artists to create work together. Each visual artist made work in response to one of the pieces of prose or poetry provided; the works will be hung together in the gallery. Try a beer from local Flying Dog Brewery during the opening reception Saturday, 7 to 9 p.m.
>> Liz Lerman Dance Exchange will have a performance at the Round House Theatre in Silver Spring next Monday, featuring their House Blend of four new works. $15, 8 p.m.
>> Jane Franklin Dance has two performances this week with the Washington Saxophone Quartet in Mint Condition. $28 general admission; Saturday 8 p.m. and Sunday 2 p.m.
Join One vs Many for their third Thursday Art Club at Dekka, where artists are invited to come create whatever they like. 6 to 9 p.m.
See new prints and paintings by Greg Minah and Alexis Granwell in the lobby of 505 9th Street NW. Opening reception Monday, 5:30 to 7 p.m., with an artist talk at 6 p.m.
Visit the WVSA ARTs Connection Third Thursday event; see their exhibit Beauty is in the Eye, then maybe get a makeover and take home free samples from LIERAC Paris. 5:30 to 7:30 p.m.
See work by D.C.-based printmaker and sculptor Kirk Waldroff at the Waddell Art Gallery. Friday, 6:30 to 8:30 p.m. The Adam Lister Gallery opens a group show this Friday, 6 to 9 p.m.
Join the Japan Information and Cultural Center for their ongoing film series, tonight featuring Still Walking. 6:30 p.m., free but must RSVP: send your name, affiliation, and the name of up to guest to jiccrsvp[at]embjapan.org. As part of their Information Exchange program, the WPA will hold a talk with Italian visual arts curator Chiara Sartori on Thursday at 6 to 7 p.m. Free but please kbilonick[at]wpadc.org. This Saturday hear about printmaking and "what it all means" with a hands-on session inspired by the works in the William T. Wiley exhibition at the Smithsonian American Art Museum. 1 to 3 p.m.
with further questions, comments or tips.